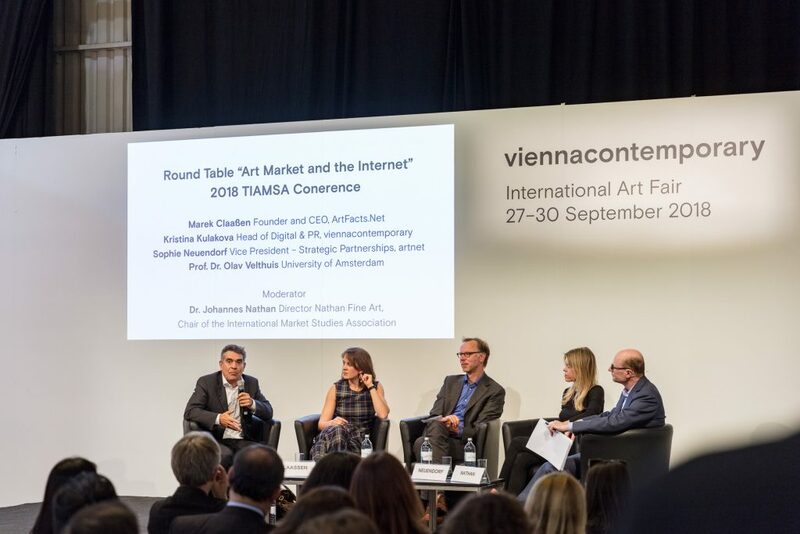 The first of the three conference locations were the halls of Vienna’s annual contemporary art fair – viennacontemporary, which hosted TIAMSA’s opening public lecture “The Art Market and the Internet”. The Roundtable discussion featured five distinguished panellists: Marek Claassen (Founder and CEO, ArtFacts.Net), Kristina Kulakova (Head of Digital and PR, viennacontemporary), Sophie Neuendorf (Vice President – Strategic Partnerships, artnet Worldwide Corp.), Olav Velthuis (Professor of Sociology, University of Amsterdam/ TIAMSA President), and Johannes Nathan (Chair of TIAMSA / Co-founder of the Centre for Art Market Studies, TU Berlin). Opening Roundtable discission from TIAMSA Confernce 2018 at viennacontemporary. (L-R) Marek Claassen (Founder and CEO, ArtFacts.Net), Kristina Kulakova (Head of Digital and PR, viennacontemporary), Olav Velthuis (Professor of Sociology, University of Amsterdam), Sophie Neuendorf (Vice President – Strategic Partnerships, artnet Worldwide Corp.), and Johannes Nathan (Chair of TIAMSA / Co-founder of the Centre for Art Market Studies, TU Berlin). Since the rise of the internet its impact on our society has grown to such an extent in recent years that it is hard to imagine a life without it. The music and film industries, for example, have been revolutionised by streaming services – so what is the situation in art, especially in the art market, and what changes are still ahead of us? The CAA 2020 conference will be held in Chicago (12-15 Feb 2020, Hilton Chicago) and we are already planning our attendance there. As a CAA affiliated society, TIAMSA is entitled to one full academic session (1.5 hours) and one „business meeting“ (1 hour). Following this year’s successful formula, we intend to use the latter as a workshop for the discussion of a specific topic proposed by a TIAMSA member. please send us a title, a very brief CV and a short abstract (3-4 sentences) outlining your idea by 31 March 2019 to office@artmarketstudies.org. The TIAMSA Board will then select the most promising proposal, bearing in mind not only academic excellence but also a proposal’s potential interest to our members and visitors of the conference. Applicants will be informed about the board’s decision in April. PRIORITY DEADLINE: March 15, 2019. Applications will be reviewed in late March. Founded in 1969, Sotheby’s Institute of Art-New York is the premier graduate school of the study of art and its markets. 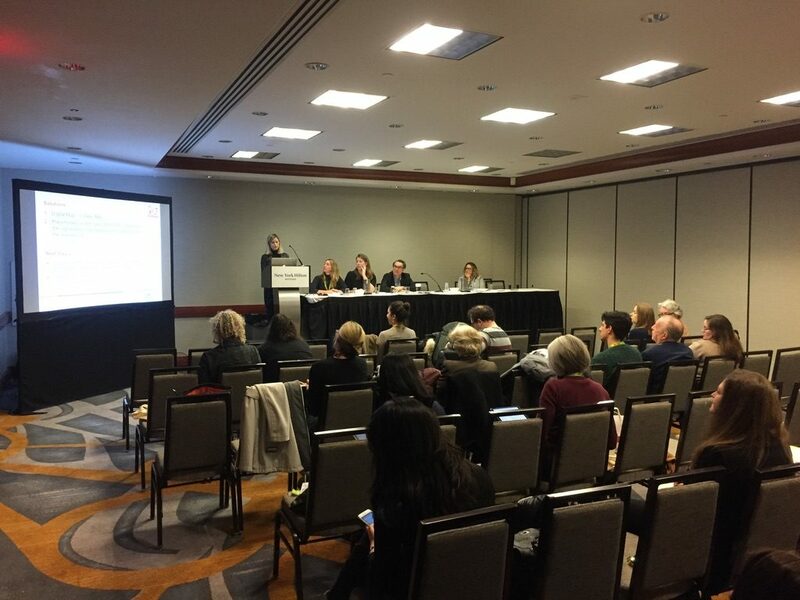 The MA in Art Business (“MAAB”) program has pioneered the development of the study of art business and the international art market as an academic discipline. At the same time, it remains a highly vocational course, with a focus on understanding business networks and professional practices. Students from MAAB progress to employment into a broad variety of jobs in art businesses, both public and private sector, across the world.